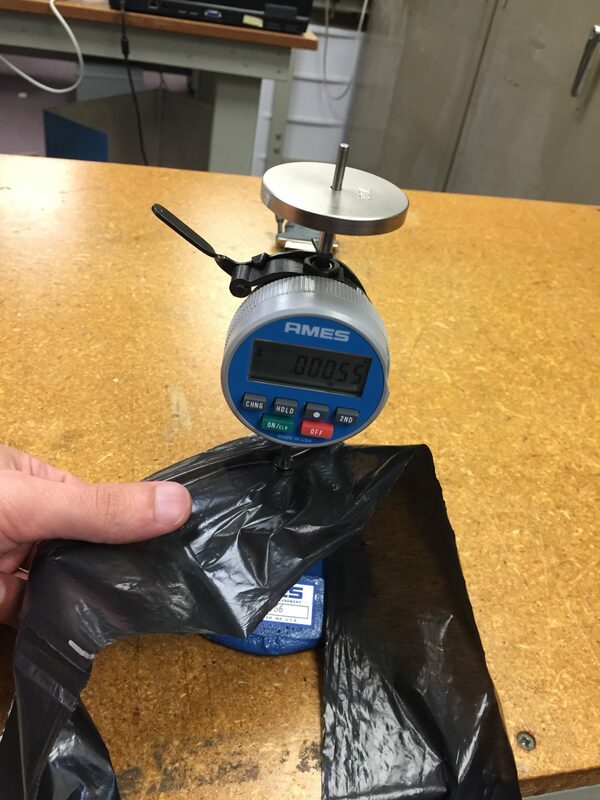 Different companies throughout the blown film industry have different philosophies when it comes to advanced thickness gauging. Some see it as critical to their operation, and some see it as an unnecessary cost. In this article, we will explore the different options for gauging on and off line and how it can improve the bottom line for a manufacturer. In blown film, thickness gauging technology allows us to see what we are producing. In this ever more competitive global marketplace, customers are expecting more from producers for less. The producers who most efficiently produce quality products will thrive, and to produce efficiently it helps to monitor your key product parameters. It starts to become all about having data that can be analyzed by all levels of the organization and provide traceability. Want to calculate the savings we can deliver? Use our on line calculator here. So how do we get good data on the key variable of thickness? Every producer has to measure thickness in one way or another, but the amount of data collected can vary greatly depending on the method. The more data collected and analyzed, the better you will be able to monitor and control your process. Control is needed to help your plant to get the benefits noted below. Everyone will have to start with a micrometer, and measuring with a micrometer provides you with some data, but does not give you the whole picture. It has some serious limitations, especially when working with thin films. If you are looking for a complete picture of the bubble, taking hundreds of data points becomes very tedious and impractical. The accuracy of the micrometer can also be a bigger issue the thinner the film you are producing. For a 0.5 mil film for example, the accuracy may only be +/- 10%. This can make it easy to miss die lines, and defects may make it into customer’s hands. Micrometers can also have a limitation on the absolute thickness. If the accuracy of the resolution is 0.05 mil for example, you could be running too thick by 0.05 mil and therefore be giving away material. For this reason, many producers have to do a gauge by weight to get a more accurate reading on their average thickness. There are solutions in the lab and on line that can significantly improve data collection, but this can be a jump for some production environments. A device like PR2000 Precision Profiler is the next step level of data collection after a micrometer. This device is sometimes called a “point to point” measurement in the blown film industry. Instead of taking 5 points (or however many you are choosing to take) along the bubble, you are now measuring every 0.125″ (3.2 mm) with a 0.125″ wide footprint which means you have complete coverage. Now QC and production don’t miss a thing. You can quickly detect defects, and use the technology to get a clear picture of how your extruder is performing. In terms of efficiency improvements, the time savings a device like this offers can have a big impact. 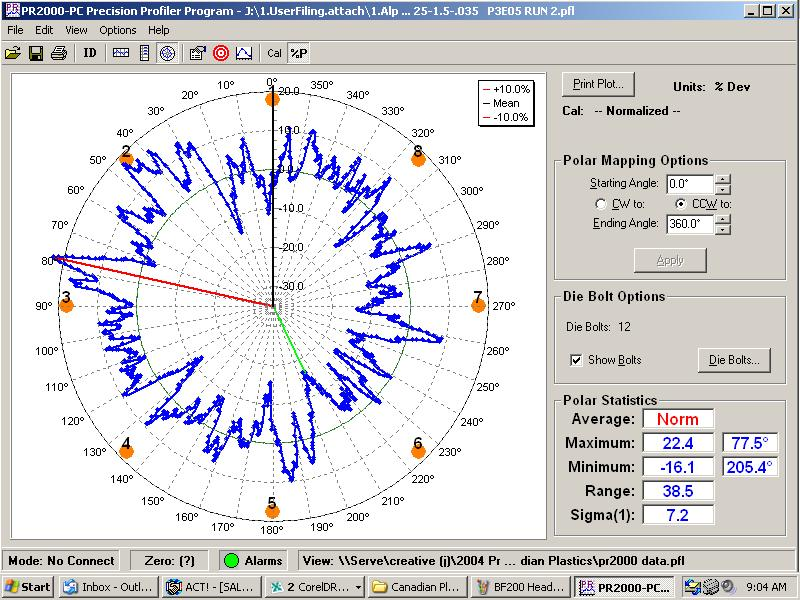 It typically takes 30 seconds to generate a profile like the one shown below using a profiler. To do something even close to this manually would take at least ten to fifteen minutes. If there is a defect, that is an additional 10 to 15 minutes of run time that is scraped. Additionally, a quality manager or technician can command a high salary, and if they are taking a sample every hour, that means they are spending one quarter of their day using a micrometer to get measurements. The labor savings in one year alone could easily justify the investment for a profiler. An advanced lab gauge like the PR2000 does not give you all the things that on line gauging does, but it is a good first step in the right direction towards better data collection and analysis. Only one is needed per lab, so you can handle multiple lines with one unit. You can make manual adjustments to the extruder using the bubble profile, and detect defects before generating too much scrap which can be particularly helpful when getting set up since you can see if any adjustments are needed to the die quickly. The quicker that you can set up the die correctly, the less material that will have to be scrapped and the faster the change over time. The benefits of going on line can be significant, but the costs increase as well. Instead of having one lab gauge for the plant, you will need one gauge for each line. However, the increased benefits can outweigh these costs. With online gauging, you are monitoring much more frequently. This decreases the amount of time it will take to make an adjustment or to notice a defect. In addition, this will allow you to do automatic feedback control depending on what type of technology you are using. 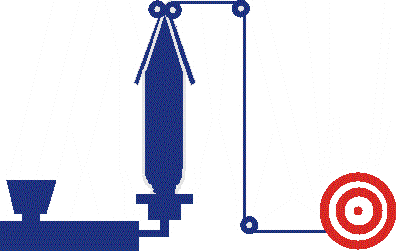 For on line thickness gauging, there are two basic options: on-the-bubble gauging and gauging after the lay flat. The on-the-bubble gauges have to use a probe that is one sided. They typically use a capacitance probe. After the lay flat, you can use a two sided capacitance gauge which is more accurate and stable SolveTech offers the BF200 for this application. The on the bubble gauges are more typically used for automatic feedback control, but are much more expensive and difficult to operate than as system that measures after the lay flat. With an after the lay flat gauge, you can get most of the same benefits much more easily and economically. When buy a brand name product in the grocery store, we usually pay a little more. The reason is typically perceived quality. Quality can be a distinguishing factor for a plastic film producer which will help build buyer loyalty and maintain your price point. Otherwise, you are just in a race to the bottom in a commodity market. Putting an overall quality program in place will require the thickness data generated by gauges. This will allow you to see overall trends, make corrections and potentially tighten your variability. If bad product reaches your customer, they may switch suppliers or send back rejected product. If a converter has a run go poorly due to improper thickness, this can hurt your relationship. Having a more uniform film and a film free from defects will make a converting or secondary processing operation go a lot smoother. This should reduce the failure rate for these processes and improve their overall quality and reliability. For example, high thickness variability may cause a film not to seal properly. With advanced gauging and proper data management, you have data on all the material produced which can be analyzed if a quality problem arises. This traceability can be critical in quickly identifying the root cause of an issue. Die lines typically form when carbon or other foreign material enter the die ring. They can be narrow, so these are not easily or quickly detected without on line monitoring. They can also be spotted with an offline gauge, but the time delay will increase. With a micrometer, the chance of seeing them is less likely. 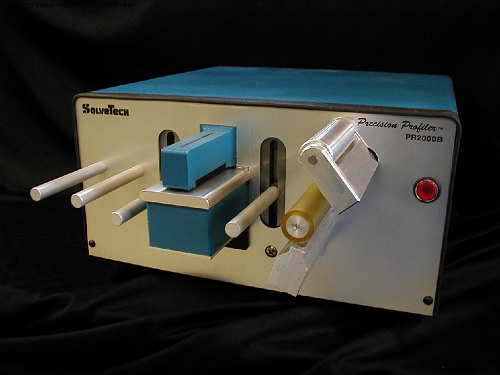 A profiler like the PR2000 can detect the die lines in the lab, and if you are taking a sample every hour, the most you scrap you could generate is one hour’s worth. With a micrometer, it may not be detected for several hours. You then have to trace back the problem and scrap all of the material that was generated. A gauge band can form for a number of reasons, and these can also be easily detected using gauging technology. Detecting any defects quickly reduces scrap and more importantly reduces wasted extrusion time. One potential benefit to gauging is the ability to tighten your variability for down gauging. 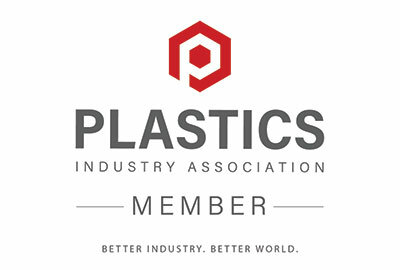 Plastic film is like a chain and it will break at it’s weakest link. Therefore, a producer’s variability will determine how high the average has to be above this minimum. By reducing variability, you can lower the average thickness while still maintaining a minimum as shown below. If for example you are able to go from an 0.8 mil average to a 0.7 mil average, you could save 15% on your material costs. It also has the added benefit of being greener! If you aren’t able to down gauge due to other restrictions on your material thickness, reducing the variability should improve your strength and permeability when keeping the average the same. This again could give you a leg up in a competitive marketplace. Maintenance and cleaning of industrial equipment has evolved over time. Many industries would run equipment until it broke, and this would create unexpected downtime. This can be quite costly, so most firms moved towards a preventive maintenance schedule. This tends to prevent unexpected down time, but can also lead to some inefficiency for two reasons. One, you may be overly aggressive, replacing and cleaning items before it is required. Two, you may have the predictive maintenance schedule wrong, and you are back to having an unexpected failure. Both of these cost time and money. The answer is predictive maintenance, and it is one of the benefits you can gain from gauging. As a die wears or becomes dirty, the variability of the film will start to increase. In blown film, people will typically clean or repair their equipment to avoid producing out of spec or defective product. Once you start to see the variability increase close to the operating limits, you know it is time to clean or maintain the equipment. This allows you maintenance and cleaning schedule to become as efficient as possible. When changing over materials or to a different thickness of material, there can be adjustments needed. Thickness gauging can help speed this change over time since it gives you the feedback to fine tune your adjustments more quickly. This will again save scrap and extruder time. Many companies can use this to their advantage to be more versatile in their product offerings. If you are looking to make changes to the formulation, it is important that you have a tool for evaluating those changes. Without advanced gauging and solid data collection, it can be difficult to see a subtle change to the uniformity of the film. With the ability to properly evaluate formulation changes, you can further improve quality and advance your product. Manual adjustments to the line can be made to help tighten product specification. In many cases, the die bolts may first be adjusted for rough adjustments and then finer adjustments will be made using an air ring. To do this affectively, it really helps to see the big picture. In the graph below, you can see the die bolt pattern laid out over the profile (orange dots labeled 1 through 8). This gives the operator specific information regarding where and how to make adjustments. On line gauging systems can be used to provide automatic feedback control. 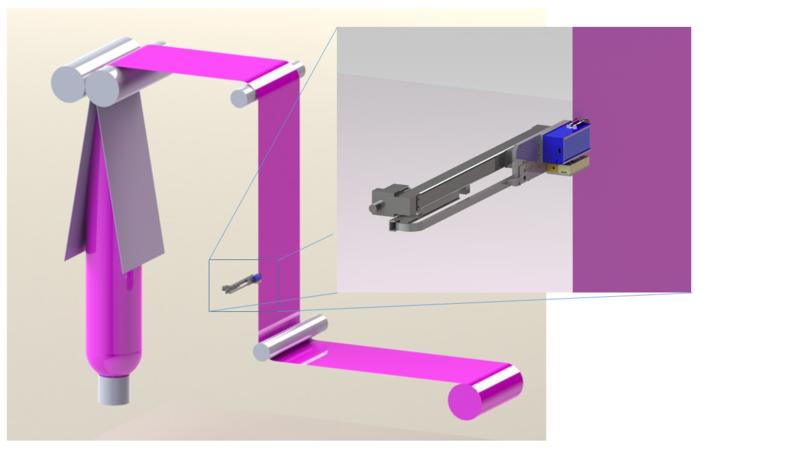 This can be done with a BF200 with an extruder that has a rotating die, but there can be problems when trying to use an after-the-lay-flat gauge with an oscillating haul off. This is due to twisting of the bubble. In many cases, automatic feedback control is done using a on the bubble system. This provides accurate information regarding the material variability and this can be quickly relayed to adjust the air ring. In summary, adding a gauging system to the blown film production process adds the value of increased efficiencies, cost savings, and improved quality. No matter how large or small the production facility, or what the value of the end product is, the improvements made by adding a gauging system will be immediately realized and provide years and years of cost savings. Consider the facts, then consult with a gauging professional to determine the return on investment that your organization could benefit from adding gauging systems to your lines. Comments or questions regarding this article? Contact us at 302-798-5400 or at info@gauging.com and we would be happy to speak with you.